Introduction: Single umbilical artery (SUA), a developmental abnormality of the umbilical cord occurs following primary agenesis or secondary atrophy of one of the arteries. It occurs in 0.08%–2% of pregnancies and associated with intrauterine growth restriction, preterm delivery, stillbirth, and congenital anomalies. Usually, the attending midwife or doctor determines the number of umbilical arteries at delivery. However, with the advent of prenatal ultrasound screening, the umbilical cord vessels can be determined as early as 14 weeks prenatally. The study aimed at determining the prevalence of SUA in University College Hospital (UCH), Nigeria, with associated anomaly (ies). Materials and Methods: This is a prospective cohort study of 989 fetuses who had detailed anomaly scan over 4 years at the ultrasound unit of the antenatal clinic, UCH. Results: Sixty-two fetuses had various anomalies, of which three had SUA, and these cohorts were followed up. The prevalence of SUA was 0.3% in both singleton and multiple gestations. Other anomalies detected with SUA include abnormal-shaped head, hypoplastic cerebellum, bilateral renal pyelectasis, bilateral ventriculomegaly, cavum septum defect, and ventricular septal defect. Conclusion: SUA is more common in twin gestations than in singletons, and if found in a fetus, it is a high risk for other anomalies which must be determined prenatally. Keywords: Congenital anomalies; prenatal; prevalence; single umbilical artery. Until recently, the absence of umbilical artery was diagnosed by examining the cord after delivery, but with advancement in ultrasound technology, the diagnosis can now be made even in the first trimester as early as 12-week gestation. However, the detection of SUA by ultrasound can be affected by many factors including length of the cord, the experience of the sonologist, thickness of the skin, the position of the baby, and resolution of the ultrasound machine. At present, the most effective method for prenatal screening of congenital anomalies is the second-trimester detailed ultrasound study. This consists of an examination of all the parts of the fetus for major anomalies which include an examination of the umbilical cord insertion and vasculature. When properly performed, the scan will successfully reveal SUA in most pregnancies and once this is identified, a careful evaluation of the fetus is indicated to rule out additional anomalies. Studies have also shown association between SUA and congenital heart disease (CHD) as an indication for additional fetal echocardiography., However, in pregnancies with an isolated SUA, fetal echocardiography is not necessary if there is a normal fetal heart four-chamber and outflow tract views on ultrasound screening examination., From literature searches, it was realized that there is dearth of studies on SUA in Nigeria. Therefore, the aim of this study is to determine the prevalence of SUA within the cohort with congenital anomalies at a tertiary hospital in Nigeria. A prospective cohort study carried out over a 4-year period, between September 2012 and August 2016, at the ultrasound unit of the antenatal clinic of the University College Hospital, a tertiary hospital in Ibadan, Nigeria. The pregnant women who presented during the study period for detailed mid-trimester screening for congenital anomalies or based on referral between 18 and 26-week gestational age were included in the study. All the cohorts were scanned by a radiologist with expertise in obstetric ultrasound using the Sonix touch and Voluson P8 General Electric ultrasound machines. During the study, the cord vessels of these fetuses were routinely checked. The technique used to evaluate the number of cord vessels on ultrasound was the use of color Doppler ultrasound to visualize the two umbilical arteries as they traverse either side of the fetal bladder [Figure 1]. In some cases, a free loop of the umbilical cord was viewed in cross-section on B-mode and the sagittal view on color Doppler. In the presence of the three vessels, a finding resembling a “Mickey Mouse” image is displayed on gray scale, while a braided, helicoidal structure is seen on sagittal view with color Doppler [Figure 2]. The diagnosis of SUA was made when only one vessel is seen on one side of the bladder with color Doppler or if only two vessels are seen on cross-sectional view of the umbilical cord on B-mode or absence of the usual braided pattern on color Doppler. Other anomalies were then screened for in the fetus. The fetuses were followed up till delivery when the associated anomalies were confirmed. A total of 989 fetuses were scanned for congenital anomalies during the study period. The fetuses consist of 957 singletons, 15 twin gestations, and 1 triplet gestation. Three cases of SUA were seen among the fetuses giving a prevalence of 0.3%. Of the three fetuses, one was from a singleton gestation while the remaining two were from two different twin gestations giving a prevalence of 6.7% and 0.1% in twin gestations and singleton fetuses, respectively. There were no significant findings in the history and examination in the mothers of the fetuses with SUA. 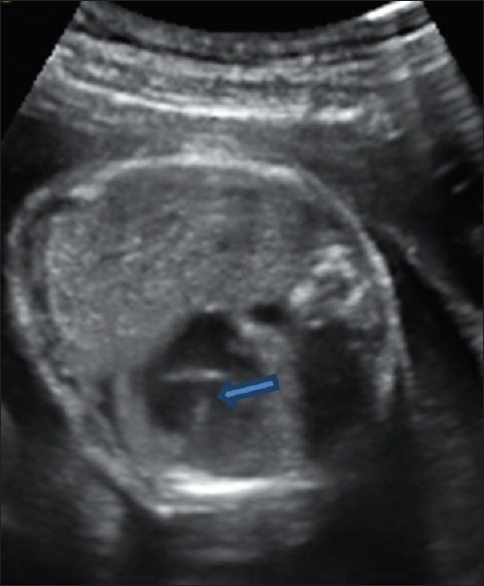 The singleton was delivered by a 24-year-old primigravida who had an anomaly scan done on account of suspected intrauterine growth restriction (IUGR) at a gestational age of 26 weeks. 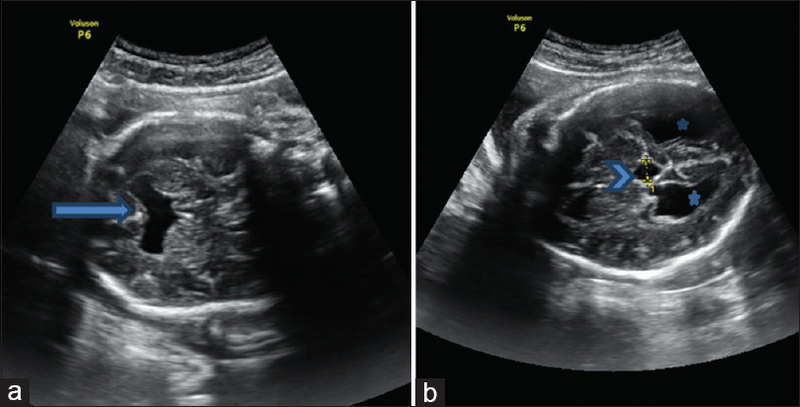 Ultrasound showed a single live intrauterine male fetus with an ultrasound diagnosis of SUA [Figure 3]; other anomalies found in the fetus were moderate bilateral ventriculomegaly and cavum septum defect [Figure 4]. She had a vaginal delivery at 39-week gestation in an outside facility with a fetal weight of 3.2 kg. However, the anomalies were not confirmed as mother did not present the baby for follow-up. The first set of twins was delivered by a 31-year-old primigravida who booked her pregnancy at the gestational age of 13 weeks 6 days and had a routine anomaly scan at 20 weeks. 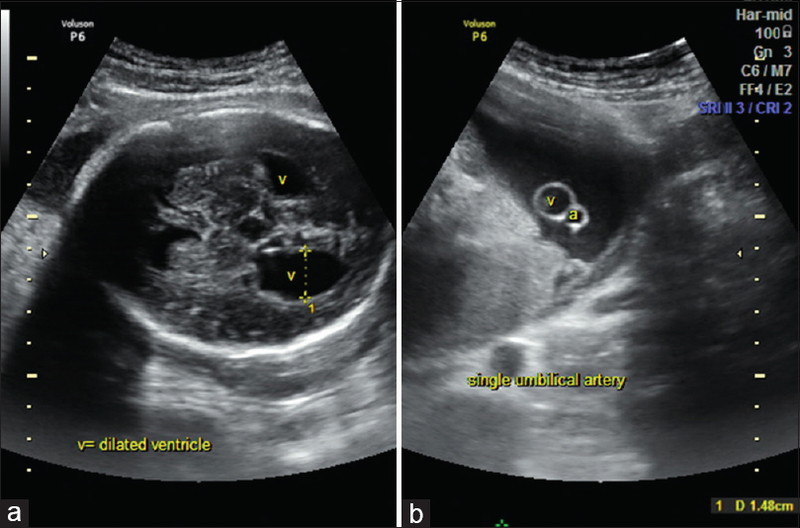 Ultrasound showed dichorionic diamniotic (DCDA) female twin fetuses with one of the twins' small for date and had a SUA [Figure 5] with suspected ventricular septal defect [Figure 6]. 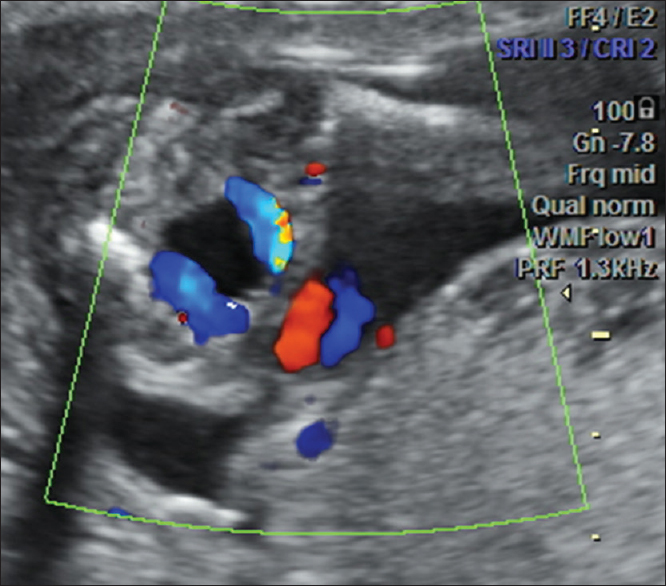 Fetal echocardiography was done for the fetus at 23 weeks, and this confirmed the diagnosis. The twins were delivered by emergency cesarean section at the gestational age of 36 weeks and 2 days on account of premature rupture of the membrane with birth weights of 1.8 kg and 2.5 kg, respectively. The twin with the SUA weighed 1.8 kg and a neonatal echocardiography done showed a double-outlet ventricle. The baby failed to thrive, and at 3 months of life, she weighed 2.5 kg. The second set of twins were delivered by a 41-year-old multigravida (G7 P3+3) who booked her pregnancy at the gestational age of 22 weeks and had an anomaly scan at 26 weeks on account of IUGR in one of the twins. Ultrasound showed DCDA twin fetuses (one female and one male). The female fetus was small for gestational age and had a SUA [Figure 7]. Other findings in the fetus were abnormally shaped head, hypoplastic cerebellum with widened cisterna magna [Figure 8] consistent with Dandy–Walker syndrome. The kidneys also showed moderate renal pyelectasis bilaterally [Figure 9]. The babies were delivered by elective CS at 39 weeks 3 days. The boy weighed 3.3 kg while the female with anomalies weighed 1.25 kg. She was noticed to have megacephaly with craniofacial disproportion in favor of the cranium. She died 18 h after delivery. SUA is the most common anatomical abnormality of the umbilical cord, and it is found in 0.08% to 1.90% of all pregnancies. The incidence of SUA is said to vary according to the population studied with increased incidence among population with high risk for malformation. The incidence of SUA in this study was 0.3% among all the fetuses studied. This prevalence is similar to that seen in the study by Leung and Robson  and Gutvirtz et al. who reported the prevalence of 0.27 and 0.3%, respectively. It is however lower than that seen in the study by Martínez-Payo et al. and Granese et al., who reported a prevalence of 1.1% and 0.4%, respectively. Burshtein et al. in a large study found a lower prevalence of 0.1%. The different prevalence might be attributed to the various study population and the different durations of the studies. The incidence of SUA increases three or four times in twins pregnancies with a range between 0.8% and 11%., This finding is in agreement with reports by Cade et al. and Martínez-Payo et al., with the prevalence of SUA among twins in their studies being 0.72% and 3.3%, respectively. There was no statistically significant difference between monochorionic and dichorionic twins. The prevalence of 6.7% among the twin pregnancies in our study also falls within this range, and both were found in dichorionic twins. The prevalence was, however, very low in the study by Leung and Robson  who all observed that the incidence of SUA in twin pregnancies was less than in singletons. These might be peculiar to the population studied. In addition to twin pregnancies, other risk factors for SUA are velamentous cord insertion, extreme maternalage, multiparity, smoking, diabetic or hypertensive mothers, and seizure disorders. Some studies noticed that the mothers of fetuses with SUA were of extreme age that is below 20 years and above 40 years, but this was not supported by other studies who found no significance in the mothers' age. Only one of the mothers from our study was over 40 years, and she was multigravida. When there is SUA in the absence of any chromosomal and structural abnormalities, it is known as isolated SUA. According to published studies, isolated SUA is more common than the nonisolated SUA, and it is seen in 64%–96% of pregnancies.,,, Lamberty et al. and Hua et al. found isolated SUA in 74.7% and 71.7% of the cases studied, respectively. Findings from our study did not agree with this as all the cases diagnosed were not isolated. This might be because of the small number of population studied or might be a peculiarity in our environment which may serve as a reference to subsequent studies. Associated anomalies may be found with a SUA in up to 30% of cases in both twin and singleton pregnancies, but the reason behind this is not clear. Previous studies on this show that any system could be associated since there was no unique pattern of the associated anomalies. However, the most frequent anomalies are genitourinary and cardiovascular malformations, but it has also been associated with other anomalies such as gastrointestinal, central nervous system, and other less common ones as diaphragmatic hernia, fetal hydrops, musculoskeletal anomalies, exstrophy of cloaca sequence, sirenomelia sequence, or VATER syndrome., The most commonly associated system with anomalies in our study was the central nervous system while the cardiovascular and genitourinary systems were also affected. Various studies have shown a significant relationship between CHD and the presence of SUA, especially in twin gestation, and it is recommended that the presence of SUA should be considered an indication for fetal echocardiography, especially if the normal four-chamber and outflow tract views of the fetal heart could not be obtained.,, In a cohort of 19,909 consecutive newborn infants with congenital malformations, SUA was associated with a 2.36 fold higher prevalence of CHD when compared to infants with a three-vessel cord. On suspicion of CHD in one of the fetuses with SUA in our study, a twin, she was referred for fetal echocardiography during which she was confirmed to have ventricular septal defect. However, a neonatal echocardiography done for the baby made a diagnosis of double-outlet ventricle. The risk of fetuses with SUA for some adverse pregnancy outcomes has been documented severally. Some studies have revealed higher rates of preterm delivery, fetal growth restriction, and perinatal mortality.,,,, Cade et al. documented that the presence of isolated SUA is linked to a poor perinatal result when compared with fetuses with two arteries. However, Predanic et al. found no difference in the incidence of small for gestational age newborns between fetuses with isolated SUA and those with a 3-vessel umbilical cord. In our study, two of the three fetuses with SUA had IUGR with fetal weight less than the tenth percentile. This is similar to the findings from the study by Murphy-Kaulbeck et al.in which about 36% of the fetus with SUA had fetal growth restriction with an estimated fetal weight of less than the tenth percentile for gestational age. Furthermore, there was an early neonatal death in one of the twins with SUA. Findings from this study confirmed that the presence of SUA in a fetus is a high risk for other congenital anomalies and poor perinatal outcome. Also that, SUA is more common in twin gestations than singletons. However, the weaknesses from the study are the small number of fetuses examined and also the fact that there was no local work in this environment to compare the study. SUA is more common in twin gestations than in singletons, and if found in a fetus, it is a high risk for other congenital anomalies and this must be determined prenatally. Mailath-Pokorny M, Worda K, Schmid M, Polterauer S, Bettelheim D. Isolated single umbilical artery: Evaluating the risk of adverse pregnancy outcome. Eur J Obstet Gynecol Reprod Biol 2015;184:80-3. Abuhamad AZ, Shaffer W, Mari G, Copel JA, Hobbins JC, Evans AT, et al. Single umbilical artery: Does it matter which artery is missing? Am J Obstet Gynecol 1995;173:728-32. Granese R, Coco C, Jeanty P. The value of single umbilical artery in the prediction of fetal aneuploidy: Findings in 12,672 pregnant women. Ultrasound Q 2007;23:117-21. Martínez-Payo C, Gaitero A, Tamarit I, García-Espantaleón M, Iglesias Goy E. Perinatal results following the prenatal ultrasound diagnosis of single umbilical artery. Acta Obstet Gynecol Scand 2005;84:1068-74. Lubusky M, Dhaifalah I, Prochazka M, Hyjanek J, Mickova I, Vomackova K, et al. Single umbilical artery and its siding in the second trimester of pregnancy: Relation to chromosomal defects. Prenat Diagn 2007;27:327-31. Byrne J, Blanc WA. Malformations and chromosome anomalies in spontaneously aborted fetuses with single umbilical artery. Am J Obstet Gynecol 1985;151:340-2. Hua M, Odibo AO, Macones GA, Roehl KA, Crane JP, Cahill AG, et al. Single umbilical artery and its associated findings. Obstet Gynecol 2010;115:930-4. Dagklis T, Defigueiredo D, Staboulidou I, Casagrandi D, Nicolaides KH. Isolated single umbilical artery and fetal karyotype. Ultrasound Obstet Gynecol 2010;36:291-5. Murphy-Kaulbeck L, Dodds L, Joseph KS, Van den Hof M. Single umbilical artery risk factors and pregnancy outcomes. Obstet Gynecol 2010;116:843-50. Ashwal E, Melamed N, Hiersch L, Edel S, Bardin R, Wiznitzer A, et al. The impact of isolated single umbilical artery on labor and delivery outcome. Prenat Diagn 2014;34:581-5. Burshtein S, Levy A, Holcberg G, Zlotnik A, Sheiner E. Is single umbilical artery an independent risk factor for perinatal mortality? Arch Gynecol Obstet 2011;283:191-4. Cade TJ, Da Silva Costa F, Reidy K, Doyle LW, Mitchell SE, Palma-Dias R, et al. Pregnancy prognosis associated with an isolated single umbilical artery in twin pregnancy. Twin Res Hum Genet 2014;17:584-8. Van den Hof MC, Wilson RD; Diagnostic Imaging Committee, Society of Obstetricians and Gynaecologists of Canada, Genetics Committee, Society of Obstetricians and Gynaecologists of Canada. Fetal soft markers in obstetric ultrasound. J Obstet Gynaecol Can 2005;27:592-636. Perri T, Cohen-Sacher B, Hod M, Berant M, Meizner I, Bar J, et al. Risk factors for cardiac malformations detected by fetal echocardiography in a tertiary center. J Matern Fetal Neonatal Med 2005;17:123-8. Gossett DR, Lantz ME, Chisholm CA. Antenatal diagnosis of single umbilical artery: Is fetal echocardiography warranted? Obstet Gynecol 2002;100:903-8.
International Society of Ultrasound in Obstetrics and Gynecology. Cardiac screening examination of the fetus: Guidelines for performing the 'basic' and 'extended basic' cardiac scan. Ultrasound Obstet Gynecol 2006;27:107-13. Leung AK, Robson WL. Single umbilical artery. A report of 159 cases. Am J Dis Child 1989;143:108-11. Gutvirtz G, Walfisch A, Beharier O, Sheiner E. Isolated single umbilical artery is an independent risk factor for perinatal mortality and adverse outcomes in term neonates. Arch Gynecol Obstet 2016;294:931-5. Victoria A, Mora G, Arias F. Perinatal outcome, placental pathology, and severity of discordance in monochorionic and dichorionic twins. Obstet Gynecol 2001;97:310-5. Iqbal S, Raiz I. Isolated single umbilical artery in twin pregnancies and its adverse pregnancy outcomes – A case report and review of literature. J Clin Diagn Res 2015;9:AD01-4. Ramesh S, Hariprasath S, Anandan G, Solomon PJ, Vijayakumar V. Single umbilical artery. J Pharm Bioallied Sci 2015;7:S83-4. Rochon M, Eddleman K. Controversial ultrasound findings. Obstet Gynecol Clin North Am 2004;31:61-99. Prucka S, Clemens M, Craven C, McPherson E. Single umbilical artery: What does it mean for the fetus? A case-control analysis of pathologically ascertained cases. Genet Med 2004;6:54-7. Lamberty CO, de Carvalho MH, Miguelez J, Liao AW, Zugaib M. Ultrasound detection rate of single umbilical artery in the first trimester of pregnancy. Prenat Diagn 2011;31:865-8. Klatt J, Kuhn A, Baumann M, Raio L. Single umbilical artery in twin pregnancies. Ultrasound Obstet Gynecol 2012;39:505-9. Li M, Wang W, Yang X, Yan Y, Wu Q. Evaluation of referral indications for fetal echocardiography in Beijing. J Ultrasound Med 2008;27:1291-6. Martínez-Frías ML, Bermejo E, Rodríguez-Pinilla E, Prieto D, ECEMC Working Group. Does single umbilical artery (SUA) predict any type of congenital defect? Clinical-epidemiological analysis of a large consecutive series of malformed infants. Am J Med Genet A 2008;146A: 15-25. Parilla BV, Tamura RK, MacGregor SN, Geibel LJ, Sabbagha RE. The clinical significance of a single umbilical artery as an isolated finding on prenatal ultrasound. Obstet Gynecol 1995;85:570-2. Doornebal N, de Vries TW, Bos AF, de Vries NK. Screening infants with an isolated single umbilical artery for renal anomalies: Nonsense? Early Hum Dev 2007;83:567-70. Callen PW. Ultrasonography in Obstetrics and Gynaecology. 4th ed. Philadelphia (PA): W.B. Saunders; 2000. Predanic M, Perni SC, Friedman A, Chervenak FA, Chasen ST. Fetal growth assessment and neonatal birth weight in fetuses with an isolated single umbilical artery. Obstet Gynecol 2005;105:1093-7. Congenital anomalies; prenatal; prevalence; single umbilical artery.